Discovery – a plan is hatched – HubNut – celebrating the average! And what a plan. A hire car, a train, probably a bus, some walking and a 170-mile drive back home in a £450 Land Rover Discovery that’s held together with gaffer tape. Oh yes, an adventure this will be! Would you drive home in this car? The car was buried away in the Parts section of Ebay, with a one-line description that at least confirmed that it had a good amount of tax and test. Interestingly, the picture above was not a feature of the advert, though some rear damage was at least mentioned. Having spent many, many hours scouring the internet for a suitable vehicle, I somehow concluded that spending £450 on the above – plus some pounds to get it home – was a sensible course of action. At this point, while the power of hindsight is still some way off, it still seems like a good idea. I’m pretty resigned to the fact that a Discovery is going to cost money, as things will need replacing. You can say that about almost any car for sale under a grand. But, I felt it was also very possible if I spent more than a grand too. After all, the ol’ Disco doesn’t have the best reputation for reliability. So, I thought it sensible to risk as little money as possible. Should it spectacularly go wrong on the journey home, I can probably sell its broken remnants on Ebay for pretty much what I’ve paid for it. I may even try to do that roadside if it happens! To be fair, it is the only Discovery that matched my basic requirement list. It had to be a 200Tdi, ideally a three-door with the funky side graphics (see above) and preferably with the standard steel wheels – I’m not an alloy fan and I’ve always loved the standard steel wheels. This motor has everything I require and the shabby bodywork doesn’t depress me. I’m likely to indulge in some greenlaning and scratches and bumps can easily occur – I’d rather take something that is already scratched and bumped with no fear of damaging its resale prospects. Spending on the engine makes a lot of sense, even with the value of the vehicle so low. 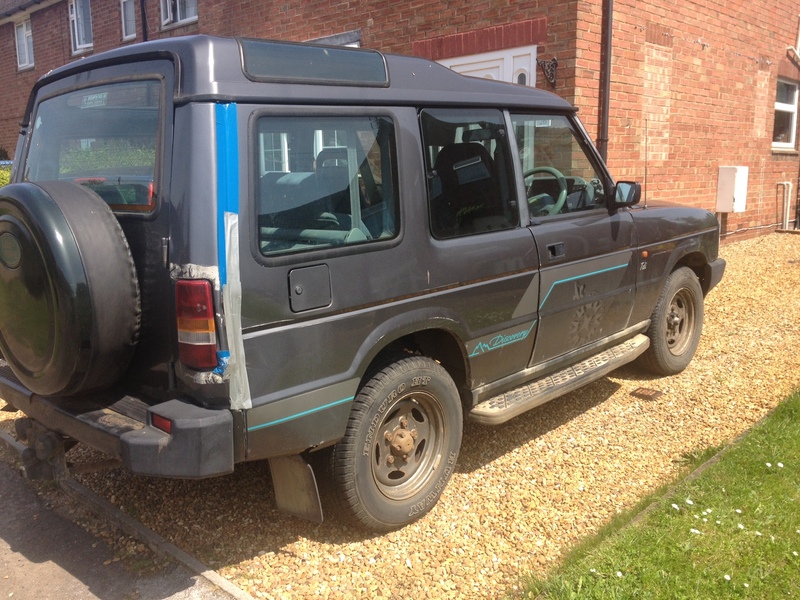 If the Disco should rust away around me, the engine alone should be worth £300. The Meccano-esque nature of the vehicle means that they are good breakers – in fact it’s why you don’t often see cheap Discos for sale – they’re good money makers. The epic journey commences tomorrow, when I collect my hire car – as yet unknown but the cheapest possible! I shall bravely set forth on Wednesday, hoping to arrive home before nightfall. I’d better do – I’m then working for several days on minibus duty!